Current selected tag: 'infographic reference'. Clear. Brush up on what’s trending in the creative world with this quick look at the top visual design themes and tools for 2014. This interactive infographic explains some of the graphic design trends you should pay attention to this year. Whether you're a web designer or graphic designer, this infographic will be useful to you. Click the image above for more information. An interesting inforgraphic that chronicles the lives of the most famous painters and the art movements they were involved in. 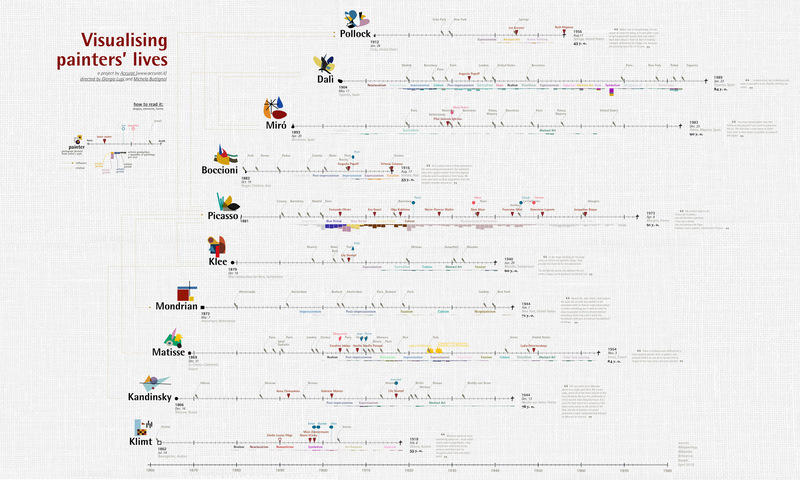 The inforgraphic tracks the lives of notable artists such as Picasso, Boccioni, Kansinsky, and Matisse. An interesting infographic that contains a wide range of facts you may not know about typography. In addition to covering the timeline of typography from 1452 to today, the infographic also gives detailed statistics about the various font families popular in the world of typography. Ever wondered what it's really like being a graphic designer? If so, this infographic does a good job of explaining the daily routine of an average graphic designer. It turns out being a graphic designer is more than just sitting at your desk fiddling with Photoshop. The huge availability of amazing infographics makes it critical to stand out and have a unique and clever design. This is not easy at all but trust me … some cool infographic design elements can be real life savers! They can be used as inspiration for how to model certain type of data and of course to save tons of valuable time required for drawing up the detailed vector graphics from scratch. An awesome collection of infographic templates you can use to create your next infographic. After downloading these templates, you'll be able to customize them and use them for your online marketing campaign.